Cool news update! For anyone who wasn't aware, the Atlanta Center for Puppetry Arts inducted the Crow & Servo puppets into their collection this past January. Just a few days ago, Brent Lohaus posted new, super close-up images of the bots to the "MST3K & ICWXP Bot and Prop Builders" group on Facebook! What's especially exciting for me is discovering that the details I've (so far) only been guessing at with the Netflix arms... Has been totally correct! Both in materials and in the methods of assembly and ambulation! Most importantly, Brent was able to get a photo that revealed the never-before-seen (by fans at least) area behind Crow's wrist sphere- specifically the spot where the puppet rod enters the wrist sphere from behind. It prevents the rod, once secured into the resin claw hand, from being pushed out of the wrist sphere from behind. 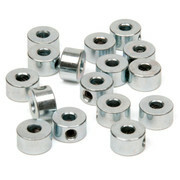 It still allows, via the set screw within the collar, for you to take apart the whole assembly for repair or replacement. More of Brent's photos give us other cool details that we can see up-close for the first time! - There's a screw in the back of the neck coupling that descends from under the bowling pin. I have to guess it's possibly for the ability to quickly switch out Crow heads should one become damaged. Or in the Nextflix case, should the servo-actuated jaw stop working. - We can see the model in the museum is that very same type of remote-operated jaw version as there's electric cables emerging from the bottom of the PVC pipe where the eye controls mount. - In that same photo we can see that the dowel rods attached to the arm rods are round. I've made a previous post where I demonstrated making them using square dowels. It's always up to the puppeteers personal preference. Many do prefer round as it allows for the rod to be easily rolled back and forth between finger and thumb with minimal effort of hand movement. I'll be certainly making a new pair with round dowels now! - Lastly, it looks like many of the joints feature washers both inside and outside of the various attachment points. I tried doing this on my own arms but ran into a problem. They may seem very thin, but washers add significant millimeters to the width of those arms. It all adds up quickly and throws off the sizing. Plus, I had never seen a photo of a screen-used Crow that was detailed enough to 100% confirm there were indeed washers present. At least now we can put that suspicion to rest. What this tells me now, is that the black spacers in-between the joints and possibly even the screws that are inside them, may indeed not be stock-sized. I already had them figured for slight alteration in lengths but it looks like that alteration could be even more significant than I thought. You see, it's all based on the side-by-side foam insulation tubes and the wrist sphere. Those items dictate a fixed width between the dowels, joints and spacers. I'll have to look again at what needs to be done to resize those later elements while allowing for the extra inclusion of all those washers. Having re-circled the wagons, I've now come to a new crossroads in regards to scales and sizes of certain element in the arms. I bought the new smaller sized hardware and reconstructed the arms based on the configuration seen in the ACPA photos I shared above. -The machine screw lengths would ideally be 2-1/4" but to date, I haven't found any sold in that length for that gauge. That length must then be achieved via cutting longer screws (in the case of those pictured, 2-1/2") down to preference. A shorter 2" screw WILL NOT work for either possible width configuration. I tried them. Due to my uncertainty in the exact length of the black nylon spacers, but now fully confident in the configuration of screws, nuts, washers, dowels and lamp joints, I have found that the precise diameter of the wrist sphere is what subsequently gets thrown into question. I built one arm using the 1-1/8" spacers and the other using the 1"
You can see by the photos that if the 1" spacer is the right size, then the 1-3/4" sphere fits perfectly between the styrene wrist joints (no nylon washers required). 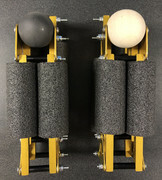 If instead the 1-1/8" spacer is the correct size to use, then the gap between wrist joints is now much too large for the smaller sphere- However the next size up, a 2" sphere, now fits perfectly between the joints. So what to do? Both look okay to me just by eye. What I believe will help break the tie is seeing what a full-sized set of enlarged grabber-claw hands look like in comparison to each sphere. To achieve a set of those means these arms are now on complete hold and it's time to get cracking on the molding and casting of the hands with the expanding resin. It’s been a wild week! But I’m so much closer to shaking hands with Crow than ever before. Which has to be much better than “Shaking Hands With Danger.” <<That’s a Rifftrax reference BTW. Hopefully they’re allowed here. I set about casting the fanny pincher claws and beginning my first foray into experimenting with HydroSpan resin in the effort to enlarge them. I’m going to recklessly assume most folks here are already familiar with the creation of silicone molds and the resin casting process so I won’t waste time typing out a full, lengthy explanation of it here. You can always search for “Smooth-On” on YouTube for a ton of videos that illustrate the steps & methods better than I could relate them anyway. The only thing of note is the preparation of the thumb/wrist half of claw- The wrist portion needs to be reduced & shortened as Netflix Crow’s wrist clearly terminates at the wooden sphere at a point closer to the rest of the hand then the original claw permits. The wooden peg you see added is the portion that will insert into the sphere after enlargement. This was also the first time in many, many years I can finally say that I had to use complex math outside of grade school. The HydroSpan resin has a mix ratio of 100A:50B by weight. That requires you to do a formula based on how many grams of part A you’ll be mixing to determine how many grams of part B you’ll need to mix as the catalyst. Thank God there was a video demonstrating how to work that formula on YouTube as well. Take THAT, 12th grade algebra! The results? HydroSpan when mixed turned out to have a viscous consistency, much like honey. Which, if you’ve worked with resins before, you’ll know is a bit thicker than the usual fare. 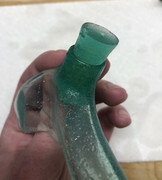 To ensure success, I created and utilized what are called “squish molds” as opposed to the more common type where you would sculpt a “pouring-spout” into the silicone for TWO REASONS <<Hey! Another Rifftrax reference! Once that cured, I discovered the HydroSpan did not become fully rigid and stayed rubbery. This made trimming the flashing away from the parts a little difficult but aside from that, the casting was successful. The next step in the instructions are to submerge the parts in water for up to ten days to reach the full 60% enlargement. I was shocked when I checked back in only 48 hours and discovered they were already at what has to be full size!!! It appears that the thinnest sections absorb the water fastest. As you can see in the photos, the denser portion of the wrist is still smaller than it should be while the thinner walls of the “thumb” exploded in scale overnight. I’ll still let the whole thing soak for a full ten days regardless. Unfortunately, the next big challenge presented itself pretty bluntly the moment I touched the enlarged parts. Due to these parts being so thin-walled and the HydroSpan material being so soft, they and now super rubbery and can’t hold their proper shape worth a darn. I don’t think there’s any way I can recast these parts to make a new silicone mold of them and not have that process fail miserably. There’s no way I could ensure the wet, slippery parts don’t float off into the silicone while it cures or guaranteeing the parts maintain a consistent and non-warped shape. A possible solution? I figure if the enlargements of thin parts won’t hold their shape, then perhaps enlargements of the thick ones (i.e. the molds that produced them) will. So back on the chemical mixing merry-go-round I go! Once the castings of the molds get “big-ified” in the water, I’ll have to make yet another set of silicone molds of those before I can attempt a standard resin casting of the larger claws… I have to say this is getting really expensive, but I learned a long time ago if you can’t embrace that fact, BotBuilding isn’t the hobby for you. It's been 10 days soaking the Hydrospan castings in water and... They're still not quite there yet. It's become quite clear to me that the denser and thicker the casting is, the longer it will have to soak before growing to it's full capacity. Likewise, thinner and less-dense parts will achieve their full scale in less time. As you can see in the following photos, the individually cast claw parts have fully grown to the full size of the Netflix Crow hands. Regrettably they remain unsuitable to re-cast due to their overly soft & rubbery nature which renders them unable to hold their proper shapes in the process. The castings of the molds are holding their shapes properly as anticipated but you can see when I take them out of the water, they're still puckered in spots that have yet to fully absorb the water. Comparing them to the full-grown claw castings also shows me how much more they have to grow to catch up. Been reading and following your current Crow project, well done sir ! Read up on this HydroSpan material, very interesting and dam handy it seems. I would be most interested in resin cast copys of this current Crow, please keep me in mind, id like to help you off-set some of your cost of your R&D. Thank you very much! I'll certainly keep you in mind. Let's just keep our fingers crossed that I can successfully achieve a decent set of enlarged resin hands when all's said and done. The molds continue to grow measurably! It's been 19 days since they started their soak and they've been gaining in scale every day. You'll see in the photos, on the right-most side, is a set of the molds I made which weren't mixed as well as they should have been, thus I didn't attempt enlarging them. They've proven useful however as baselines to measure against the growing copies. Also useful have been the cast set of claw parts (left-most side) which allow me to see how much further the molds need to still expand before they're ready for silicone recasting. Based on the progress I'm observing, I'm going to estimate it'll probably still be around another two to three weeks before they're finished. In news unrelated to Crow's arms but still relevant to Netflix Crow in general, I've been fortunate to discover for the first time what I'm going to call the "SledgeRiprock Method" or "Bob Method" of Crow building. Having built my Crow years ago, long before Bob started making and selling his Bot kits, I'd actually never seen or sought out to learn how he managed construction of the inner PVC pipe controls. I just implemented my own method based on the knowledge the bot building community had at the time. Thankfully, someone shared with me the instructions Bob includes with his Crow kits and it's been a Rosetta Stone (Crow-setta Stone?) for figuring out the rest Netflix Crow. As we've known, they've gone to Bob for parts just like the rest of us and have clearly been assembling their on-screen bots using his construction guidelines too- Which I have to admit now that I've seen them for the first time, are really super simple and effective! I'm sure everyone is reading that and saying, "Duh, yeah. We know." Hey, cut an old-timer some slack! The one thing I've been taking my time on is making sure I compare measurements of the PVC sections given in the Crow kit instructions to photo references from the show. Now, I fully believe that every Crow, even those made for the show, are all slightly different. But I did find some sight discrepancies in the lengths of piping that make up the neck and the stalk on which the soap dish is perched to what the recommended length is in those instructions. That's NOT a criticism, mind you! Just an observation based on photo-matching. We've already confirmed Russ made a number of alterations to Bob's initial designs, even though all evidence points to the fact he's still using the same basic method in the PVC pipe controls. But in order to match the best average of what I'm seeing for Netflix Crow in screengrabs and press photos, both lengths of PVC pipe that make up the upper portion of those controls need to be slightly shorter by around a 1/4" to a 1/2". I can only recommend you to look closely at the photos and do what feels & looks best to you! I can take the neck measurements that I wound up settling on and post them if anyone's interested. In the meantime, I'll continue to focus on the arms. Day 28. The mold castings are still at only 70% or so of what I know they can enlarge to. Something's got to be wrong. My first plan of attack: Relocate the Hydrospan parts to a spot where I can add an electric fish tank heater. It's recommended the water stay around 70 degrees for proper absorption. Maybe my water's been too cold. If that's unsuccessful, it looks like I'll have to see if I can devote some of this month's paycheck to buying another round of Hydrospan and trying again. Maybe I messed up the A to B chemical mix. I might also try a suggestion I found online that recommends inserting plastic rods into the backside of the uncured hydrospan as it sits in the mold. Once removed, that should allow channels to form in the denser areas into which water can more easily penetrate later on.